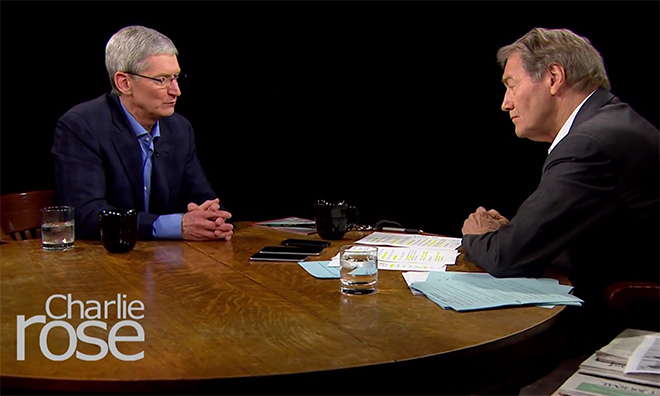 In the second segment of a two-part interview with Charlie Rose, Apple CEO Tim Cook discusses privacy issues, workplace diversity, Apple's driving philosophy and the company's tie-up with rock band U2. Among the wide-ranging topics, Cook said Apple's business is not based on gathering consumer information, as with other companies like Google, but selling products like the new iPhone 6 and iPhone 6 Plus. "Our business is not based on having information about you. You're not our product," Cook said, adding, "Our product are these, and this watch, and Macs and so forth. And so we run a very different company. I think everyone has to ask, how do companies make their money? Follow the money. And if they're making money mainly by collecting gobs of personal data, I think you have a right to be worried." Cook goes on to detail his ideals on diversity in the workplace, saying everyone should be treated with respect. The CEO's statements come one month after Apple released a report on employee diversity, which highlighted a preponderance of white male workers. "Treating people with dignity. Treating people the same. That everyone deserves a basic level of human rights, regardless of their color, regardless of their religion, regardless of their sexual orientation, regardless of their gender. That everyone deserves respect. And, you know, I'll fight for it until my toes point out," Cook said. As for the now notorious U2 album, which Apple pushed out to iTunes users for free last week, Cook's said the focus was on giving back to iTunes users. The brief mention was filmed before it was discovered that Apple linked U2's new "Songs of Innocence" LP to user accounts, prompting the company to launched an opt-out webpage on Monday. "Some may not love it. I hope they all do. But it was more about our customers," Cook said of the album. "And so, it felt great to participate in something that's music history —one of the largest album releases ever. But the real thing was giving something to our users." Rose first sat down with the Apple chief last week, covering upcoming products like the Apple TV to the recently announced iPhone lineup. The final segment of Cook's interview will air Monday night on PBS and will replay Tuesday on Bloomberg TV at 8 p.m. and 10 p.m. Eastern. In addition to Cook, Rose sits down with designer Yves Behar, who recently took on the role of chief creative officer at Jawbone.